Juanita Kawamoto, owner of Fresh From the Farm LLC, buys produce from local farmers and sells it at farmers' markets as well as online. Above, Kawamoto is at her booth at the Kapiolani Community College Farmers' Market. For Juanita Kawamoto, owner of Fresh From the Farm LLC, bringing Hawaii farmers' goods to the market is more than a business -- it's a passion. She has made it her mission to help sell the bounty of small to midsized farms in Hawaii through her business, which markets the goods online and then delivers at the Farm Bureau's farmers' markets. Though she is the first to admit that online sales at www.farmfreshhawaii.com have not quite caught on yet, she sees the potential for more growth. Every year, she said the five-year-old business is adding goods from more farms, and seeing more customers who demand locally grown and organic produce. She expects that to grow when Whole Foods Market opens its first store next year. Her goal is to connect the customer to the farm, to help explain where food is grown in Hawaii -- and to deliver the bounty with aloha spirit. 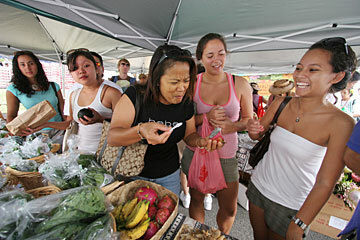 Josie Pablo, right, and her Kapiolani Community College roommate Joanne Kaona, second from right, are amused at Veronica Pablo's expression, center, after Veronica, who is Josie's mom, tried one of the unusual fruits that was at Juanita Kawamoto's booth at the Kapiolani Community College Farmers' Market. Kawamoto is owner of Fresh From the Farm LLC. It's hard to miss Juanita Kawamoto at the Saturday farmers' market at Kapiolani Community College. Wearing a signature, locally crafted hat, the owner of Fresh From the Farm LLC bustles around her booth, bagging bright, red mangoes, glistening, gold papayas, Makawao mushrooms, bags of coffee and jars of honey and jam. She chats with customers about what's in season and specific regions. For instance, where the mangoes are grown, their flavors and textures, and the difference between organic and non-organic. Besides produce, she offers protea from Kula, Maui, orchids from the Big Island, and more than 20 different kinds of coffees. The five-year-old business, which operates a virtual reality farmers' market through an online portal -- www. farmfreshhawaii.com -- brings local produce to the consumer through the Internet and the farmers' market. Customers can order the products online, then pick them up at one of the farmers' markets during the week, or they can go straight to the market to shop. Though it's virtual, the family-run business by Juanita, her husband Robert, and son, Beau, is very personal and hands-on. Kawamoto visits all the farms personally, develops relationships with the farmers, and chooses what to market and offer on Fresh From the Farm. "It's very important to us to make sure what all the customers are getting are of the best quality," Kawamoto said. The one criteria is that all the products are made or grown in Hawaii. That has become a mission for Fresh From the Farm, to be an alternative venue for farmers to sell their goods, and play a role in the sustainability of the state's regional farms. "We try really hard to understand what the farmer's needs are, and do our best to represent that to our customers," Kawamoto said. "That's a big part of it. Even though it's a virtual farmers' market, we see the customer every time we do a delivery." More importantly, she said, is the aloha spirit when delivering the goods. She has a booth at all of the state Farm Bureau's current markets, including at Kapiolani Community College near Diamond Head on Saturday mornings, Mililani on Sundays and Kailua on Thursday evenings. 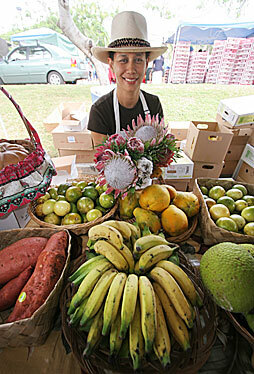 Originally, Kawamoto planned to open a bricks-and-mortar farmers' market on family land she inherited in Kihei, Maui. But the permitting process and cost of building it was daunting, and when presented with an opportunity to do a virtual farmers' market, she decided to try it. The concept exists on the mainland, she said, but she had doubts at first whether it would fly in Hawaii, given the small to midsized farms here. Today, those are the very farms she targets and it has proven to be her niche. Funds and support for starting the business came from the state, Maui County's farm bureau and office of economic development. The business is operated out of a small office in Liliha, but cuts out the costs of warehousing by picking up orders and goods right before the start of the weekly farmers' markets. Fresh From the Farm currently sells produce from more than 50 farms -- on all four major islands -- ranging from coffee to fruits (papayas, mangoes, apple bananas, lilikoi, starfruit), a broad assortment of vegetables, herbs, and locally made soaps, jams, honeys, and dressings. The fruits of local farmers' labors are clearly Kawamoto's passion as she introduces them to customers -- many of them regulars who she knows by name. She equates a beautifully produced pomelo to a Gauguin or a Mozart. Due to customer demand, she began a few years ago to shift her focus to organic and natural produce, although she also carries items from conventional farms. People today are more concerned about health, but also more environmentally aware, she said, and they want to know where their food comes from. "Today, we've lost the feeling of being connected to the farm," she said. "My grandparents would personally know the farmer they bought their fruits from, or the fisherman they bought their fish from, and it was just this aloha." Most of the farmers are humble and hard-working, she said, more preoccupied about whether their crops will stay pest-free or ride out the rainstorm than in how to market their produce. Besides regular customers at the farmers' markets, Kawamoto counts local chefs and R. Field Co. as clients. Sean Priester, executive chef of Top of Waikiki, said he recently began buying from Fresh because with the volume his restaurant gets, he has to plan a set menu without last-minute changes. His strategy is to use seasonal, local products -- knowing that it will likely be available. Breadfruit, or ulu, for instance, has been in season, so he has a seared scallop with pancetta and ulua mash, as well as crab and ulu ravioli, and for Thanksgiving, assiago bread and ulu stuffing. "I support buying local because I know who the farmer is, I know where the product came from and how long ago it was picked," he said. "And the flavor profiles are better." Citrus, including Meyer lemons and Tahitian limes, are also featured on the menu. Ed Kenney, owner-chef of Town and Downtown -- whose mantra is "local first, organic when possible" -- has been buying from Fresh for two years. "As a chef, my primary goal is to make food that tastes good," he said, "and it is clearly obvious that something grown locally and picked ripe is more flavorful than something picked green, refrigerated and shipped thousands of miles over a period of days or weeks." But it's also related to the environment, as well as supporting the local economy and health. "Juanita has greatly broadened our palette of ingredients," Kenney said. Among the items he buys regularly are bananas, baby bok choi, avocado, escarole, frisee, tomatoes, lilikoi, rambutan, papaya, ulu and summer squash. Though her heart is in it, Fresh From the Farm is still struggling to make a profit. But Kawamoto sees it grow every year, with more customers and farmers coming on board. Shipping costs have been the biggest blow to the business so far, she said. New farms that have signed on include the Maui Cattle Co., which offers natural-fed beef, and Land of Organica sorbet. Kawamoto said she'd like to expand out to Molokai and Lanai. "With more farms, I get more sales," she said. Online sales currently make up only 10 percent of sales, and is slow to catch on, but Kawamoto is confident there is more potential for growth in that area. When a customer orders online, then cost savings can potentially range up to 40 percent because it will help manage shipping and bookkeeping, as well as help the farmer plan his crops. She doesn't plan to sell to the mainland -- though it is a possibility with dry goods, like the soaps and jams, in the future. Fresh From the Farm recently rented a commercial kitchen in which it is going to develop private-label products made from the local goods. Kawamoto's son, Beau Beair, is a chef, who will take the lead. If the current generation of shoppers, for instance, are not into shopping online, she said, chances are that their kids and grandkids will. It's just a matter of time. She wants to set up a small kiosk at the market with a workstation that will demonstrate how people can order online -- even order in advance for the next week. As for Whole Foods Market's arrival, Kawamoto sees it as a way to boost more interest in organic and local produce. But she will continue to focus on buying from small farmers, even if that means smaller quantities on a particular day. Being smaller means being more flexible, she said. "Even though you might want a Kula or Hana tomato," she said, "if it's not available, I can still offer you a Big Island tomato." Being able to sell smaller quantities would help many small farmers, according to Al Santoro, owner of the seven-acre Poamoho Organic Produce and president of the Hawaii Cooperative of Organic Farmers. Santoro said it's also helpful if more customers can buy what's in season. Santoro uses other distributors, but he knows with Fresh From the Farm, he won't be getting any sudden or unexpected cancellations in the middle of mango season -- which happened recently. Larger distributors often have little connection to Hawaii's farmers, according to Santoro, and would prefer to bring in tons of imported fresh produce. Farmers, as he knows firsthand, are also subject to the whims of Mother Nature, whether she wants to bring a fire, rainstorm or drought. Fresh From the Farm was Poamoho's biggest customer for the mango crop --- with avocados coming next, followed by lemons, lime, oranges, tangerines and starfruits. 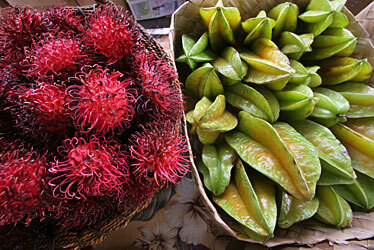 Rambutan, left, and starfruit at the Farmers' Market. » Produce: Ranges from Makawao mushrooms to orange lilikoi, Rapoza mangoes, starfruit, tomatoes, sea asparagus and organic Swiss chard. » Farmers' Markets: Saturdays, 7:30 a.m. to 11 a.m., Kapiolani Community College; Sundays, 8 a.m. to 11 a.m., Mililani High School; Thursdays, 5 p.m. to 7 p.m., Kailua Longs Drug parking lot.